CULLMAN – It’s been almost four months since the March 19 hailstorm shuttered businesses in Cullman’s Marktplatz shopping center. 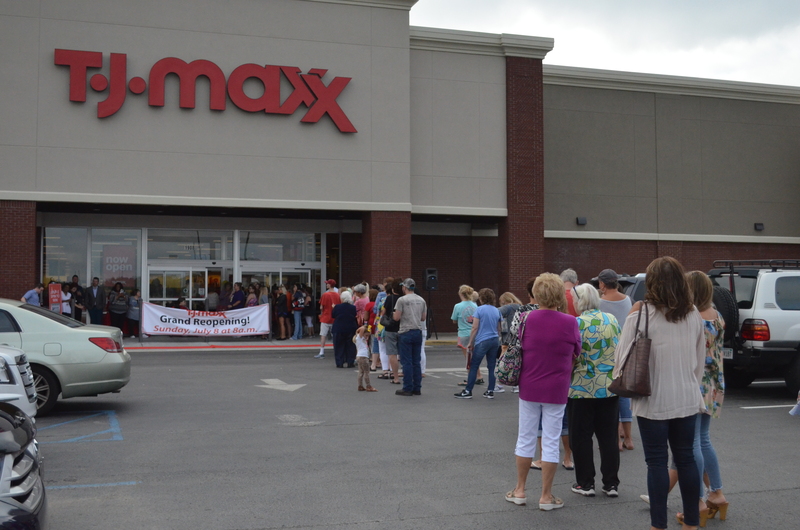 On Sunday morning, the center’s anchor, T.J. Maxx, officially re-opened its doors to an anxious crowd that gathered bright and early in anticipation for the special 8 a.m. opening. Donna Brown, who has managed the Cullman T.J. Maxx for three years, said she is ready to get back on track. She took a minute to address the excited crowd before cutting the ribbon. “We really appreciate the fact that you all took a few moments out of your busy schedules to support us this morning. We are so excited to be back home. Three months and 19 days ago, the store closed due to storm damage, and many of you were impacted by that, but we had the privilege to work in many of our sister stores to help them out while we were rebuilding,” Brown said. “Now, we’re glad to be back home and we’re better than we were before. Thank you to all of you for coming out today and if you see anything that you feel like we need to do different to make your shopping experience better, let us know, and if it’s anything that we can do within our power we’ll see that it happens. We want to execute extraordinary values to our customers every single day,” she said. Roy Drinkard, whose company Drinkard Development owns the Marktplatz center, cut the ribbon on the repaired store himself. Sunday morning’s event was about more than shopping. Victim Services of Cullman is a local nonprofit organization that offers services to families dealing with sexual abuse or domestic violence. T.J. Maxx is located at 1908 Marketplatz Center SW and is open from 9:30 a.m. to 9:30 p.m. Monday through Saturday and from 11 a.m. to 8 p.m. on Sundays.